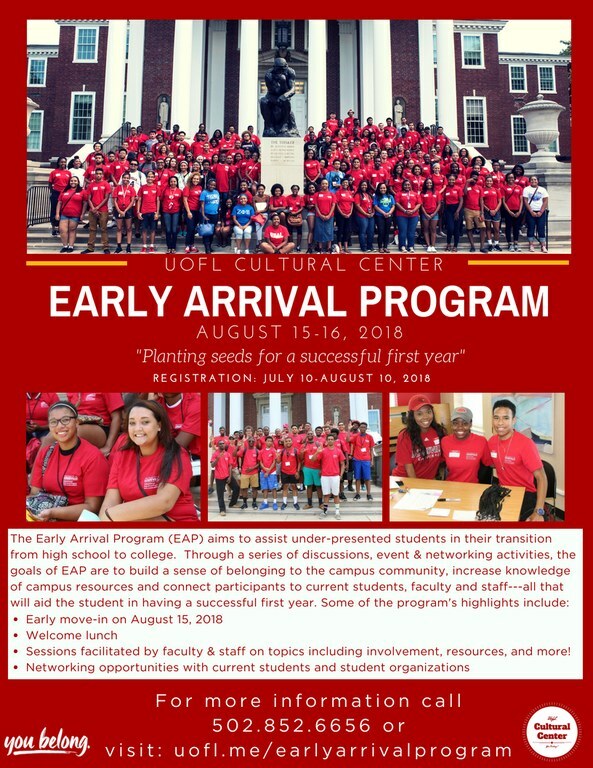 The Cultural Center Early Arrival Program (EAP) was created to help ease the high school to college transition for incoming African-American & Black students participating in the Cultural Center’s retention programs. The two-day long annual orientation takes place August 15-16, 2018. The program includes a variety of an enriching series of discussions, events and networking activities about what it means to be an active and engaged student at the University of Louisville. The program is only open to students who register and there is no cost to the student. Meals, programming, and the early housing move-in component are provided by the program. At the conclusion, EAP participants will transition into the university's Welcome Week schedule of events. Eligible students will receive an invitation via their University of Louisville email address no later than July 12, 2018 with additional program and registration information. 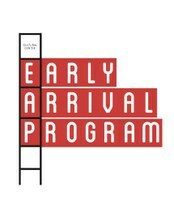 Registration for the Early Arrival Program will be July 10, 2018- August 10, 2018 (form will close at 11:45pm). Please note: Students will need to log into Orgsync (platform where registration form is located) using their UofL Ulink user name and password). If this is their first time logging into Orgsync, the student will be prompted to enter some basic information into their profile. Please contact the Cultural Center 502-852-6656 or Leondra Gully at leondra.gully@louisville.edu if you encounter any issues while registering. Be sure to check out this list of things to do and reminders to help you prepare for the Early Arrival Program before classes start.